Interplay has apparently defeated Bethesda in the initial stages of their lawsuit (Edit: link clarifies the current situation of the lawsuit) and has decided to celebrate by releasing a bit of concept art from Project V13! You can view it on the Interplay forums (have to be a registered user), or you can see it below. Read more after the pic! Interplay released a whole bunch of other concept art as part of their lawsuit, which can be viewed on the official legal website. Interplay also confirmed in their lawsuit that they already have the game up and running in a demo version. 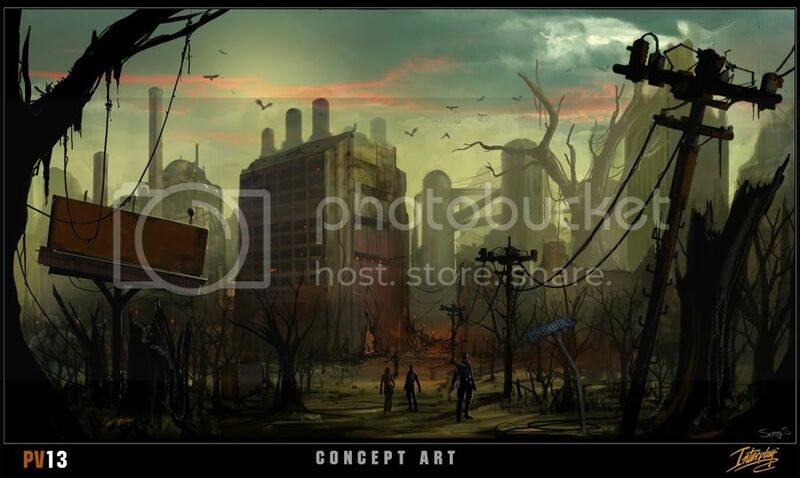 Some of the concept art for the game has been released due to the lawsuit. This forum will be a place where we can post high quality versions of the same art and you can give us some feedback on it at the same time. Keep in mind that this is concept art. It's not finalized art, but it will give you a feel for what we are aiming for with V13. Note: Only registered forum members can view the concept art. Thanks very much again to IPLY long-time investor Frymuchan for letting us know! We don’t comment on legal matters. Expected, but it would be nice to hear both sides of the argument. All we have to go on right now is a bunch of Interplay fanfare. News related to Top Story: Project V13 Concept Art Revealed! Edit: NOT Fallout Movie, but "The Fallout"